Week one completed and its been a bizarre week. We have eaten about a meal or so a day and covered between 20-60km a day. 20 the day we started because it was very hot and we started at 12.30. The past few days have been good becWeek one completed and its been a bizarre week. 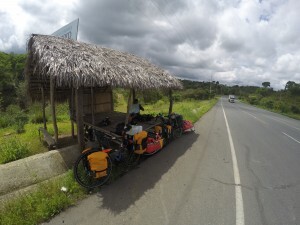 We have eaten about a meal or so a day and covered between 20-60km a day. 20 the day we started because it was very hot and we started at 12.30. The past few days have been good because its been rather flat! Im both nervous and excited for the Andes bit, nervous for the going up the mountains but excited for the views. The people have been really kind so far, a few people have said no we cant camp in their garden or that we cant cook our rice in their kitchen, which is fair enough! I did have one man spit and say ‘no te intiendo’ But the majority have been so welcoming and as soon as we explain what we are doing they say would you like to eat something? Which is lovely! or we have asked to take some mangos or bananas from peoples trees as they are in such abundance. Our stable diet has been mainly mangos and a bit of rice. The annoying bit has been the lack of sleep! sleeping virtually on a road or in a petrol station has been noisy and usually bright with street lamps plus being constantly on guard that someone may try and steal our stuff. But I must say, I’m getting used to it. ause its been rather flat! Im both nervous and excited for the Andes bit, nervous for the going up the mountains but excited for the views.